Pit all your wits and weapons against the savage wildernesses and the denizens of forgotten empires in the Serpent's Skull Adventure Path. 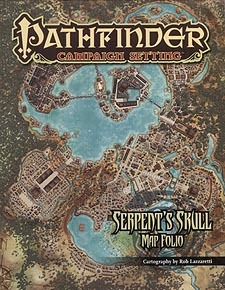 From forays into the jungle's depths to explorations of legendary lost ruins, the Serpent's Skull Poster Map Folio provides maps for the entire campaign. Within this map folio you'll find three huge 8-panel poster maps crucial to the Serpent's Skull Adventure Path - the infamous pirate's graveyard of Smuggler's Shiv, the lost ruins of Saventh-Yhi, and the monstrous underground city of Ilmurea. Even if you aren't running the Serpent's Skull Adventure Path, the maps inside can serve as mysterious treasure islands, lost ruins, and vast underground cities for any RPG campaign. The wilds' greatest secrets await within.